Just because your work is digital doesn’t mean you shouldn’t use print marketing to build your brand. Whatever you can do to get your name out there will help generate more web design clients. Even when you specialize in web design, the print materials you distribute are also representative of your work. They give people a taste of your design skills by showing how you perform for your most important client — yourself. That’s a lot of pressure, and can definitely be overwhelming. Unfortunately, not all print marketing materials are created equal, so you don’t want to waste your time using a medium that might not be successful. Luckily, we’ve put together some proven print marketing tools to help out your web design business. Business cards are a must for any business. In some cases, they can be the first impression of your work people receive. This is why it’s so important to have a design that stands out. You can do this with an awesome logo like Alex Davies’ card above. He uses a capital A as the main focal point of the logo. The negative space on the side of the letter creates another capital A. You can also change things up with a vertical design (like the one Marissa Mullen uses) as opposed to the traditional horizontal orientation. Brochures are a great way to showcase multiple pieces of your work. You can also include additional information about your services including your capabilities, credentials and fees. You can have some pages that show one large design you completed for a client, or examples of the same design with various changes as shown in the designs above. Report covers offer a way to group your samples together and include additional information. Depending on the type of cover, it can be easy to swap pages out if you decide to add, remove or change the order of your work. Report covers also give you a little more flexibility with the type of stock used, as shown by the two designs above. One features a traditional stock, while the other uses a Kraft stock, which also highlights a commitment to the environment. FEMA uses the image on the cover to highlight their eco-friendliness, along with a color scheme reminiscent of grass and sunshine. When promoting your work with a flyer, including visual examples is important, but it’s also vital to support those examples with other information. Pixel & Code’s flyer shows some examples of its work, but also includes information about the company’s services and employees, along with their credentials. It provides enough information to pique potential clients’ interests and direct them online for more. 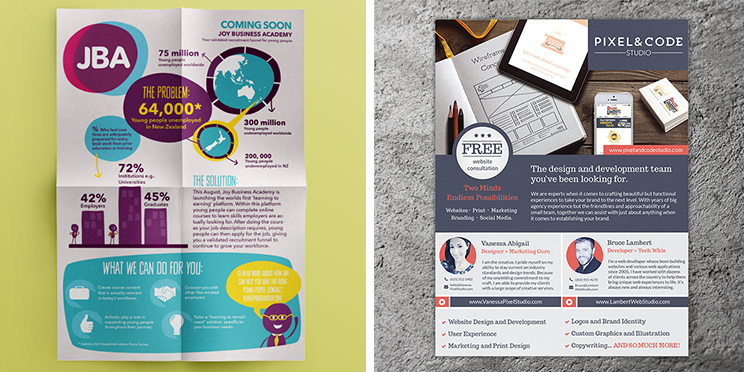 JBA’s flyer takes a different approach by using less text and more images and graphs to illustrate key points. Neither is wrong; it’s up to you to decide how to best present your information. Binders are similar to report covers in that they provide a way to group multiple examples of your work, as well as additional information about your services. The major differences are that binders are more durable and make it simpler to exchange and rearrange materials. Be sure to use a color scheme complimentary of your brand, as is the case with the Tigerpaw Software binder above; its black and orange color scheme mirrors the colors of a tiger. OPZ’s design carries from the cover of the binder to the pages inside by including the logo at the top of the front page and in the background. The blue color scheme evokes feelings of security and calmness. A great way to get your name out there is by using direct mail. It allows you to target specific areas and reach people you might not otherwise reach with only digital marketing. Postcards are an inexpensive way to do that. While it is a print product, you can use it to link to your digital content using a QR code like the one on 1Eighty Design’s postcard above. It’s a similar case with the Collective Campout postcard, only instead of a QR code, the group chose to use its website URL. It’s important to remember that while your message and samples are important, people also are judging the means of delivery. That’s what makes envelopes a great print marketing material, whether they are used to send an invoice or your portfolio. The designs above provide good examples of both, with the first featuring a large amount of color to get the recipient’s attention. Larger envelopes also give you more space to highlight your design skills. Still, smaller details matter too, which is why it’s just as important to have a great design on the smaller envelopes. The envelope design above for ReCycle (a cycling-related nonprofit) gives away what the organization does by using a bicycle wheel in the logo. Window decals are a great way to show off your skills before people walk in your door. Vesica Design’s decal above uses two overlapping circles, which illustrates a close relationship between the company and its clients. One Six Five’s design is simple and clean, featuring only a logo that looks like an eye to represent the eye-catching items inside. You can also use decals on your vehicle to take your brand on the road. People will see it on your daily commute, as well as when you’re stuck in traffic or parked. Print marketing is just as important as digital marketing, even when you work in a digital industry. You can use it to draw people to your website and highlight your skills. Like digital marketing, your methods of print can vary based on your budget. Make sure to use one strategy at a time so you can keep track of your return on investment. There are a lot of different options, but hopefully these tools will put you on the right track.